Irish singer songwriter Andrew Hozier-Byrne came out of nowhere to score a worldwide smash hit with Take Me To Church. It was a hit first in Europe and then in North America in 2015. Of course the big question is longevity. Is he a one hit wonder? He was born Mar. 17, 1990 in Bray, County Wicklow, Ireland. So yeah, an Irishman born on St. Patrick's Day. His father was a local blues singer. Hozier says he was heavily influenced by listening to Delta Blues. While studying music at Trinity College in Dublin, he was in the Trinity Orchestra. He dropped out of school to record demos for Universal Music. Then he was a member of the popular choral group Anuna for several years. Hozier self released Take Me To Church as an EP in 2013. It got the attention of local label Rubyworks and producer Rob Kirwin. Kirwin has worked with U2 among others. Kirwin reworked Take Me To Church with new backing tracks but he kept Hozier's vocal. Then the video got a lot of attention on Youtube. The song is about Hozier's frustration with homophobia in the Catholic Church. It's a hot button topic. This got him a record deal with Island. Take Me To Church was a big hit in Europe and this got him a US record deal with Columbia. The song reached #2 on the Billboard Hot 100. The album has sold two million copies worldwide. This guy literally came out of nowhere. Hozier has been on tour for the last year. Take Me To Church was nominated for a Song of the Year Grammy and Hozier performed the song with Annie Lennox on the Grammy Awards broadcast. He recently told Associated Press that when he finishes touring he will record a new album. And that's the big question about Hozier. Can he maintain his success? One never knows in the music business. 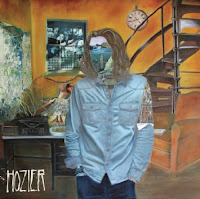 Here's the video for Take Me To Church by Hozier.